Update: read our full Samsung Galaxy i7500 review. 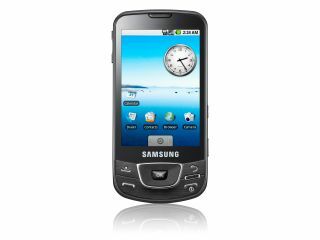 TechRadar recently reported that Samsung will be launching its first Android phone, the i7500, set to debut in the UK in Q3. Here, we take an in-depth look at the latest Android phone to give you the run-down on what you can expect from Samsung's first effort at a Google phone, the Samsung i7500. You could hardly call it a gripe, but when we spoke to Patrick Chomet, global director of terminals at Vodafone, he told us that the HTC Magic comes with a poorer camera and no 3.5mm headphone jack because the designers wanted to preserve the 14mm-thin frame of the handset. Well, Samsung heard that and went 'Pschaw!' (or some other derisory sound) and shaved 2.1mm off the frame, down to 11.9mm. Not only that, but it managed to pack a better camera, flash and 3.5mm jack into the i7500, too. Take that, HTC. Just two years ago most people wouldn't have a clue what OLED technology was; fast forward to 2009 and it's the new in-thing, especially in mobile phones. Better battery life and thinner screens are always going to be winners for designers, but it's when you see an OLED on a phone, with clear-as-day pixels and superb colour depth that you really start to appreciate the benefits. Samsung has a long history of being a forerunner in OLED development, and it's showing in its latest crop of mobile phones. We're not sure of the correct name for it, suffice to say that whichever way up you hold the phone, even upside down, the screen will re-orient itself to be the right way up. This means you can pick the phone up in any way you want and have a good look at the screen, without having to fumble around flipping it around (and probably dropping it). Early videos hint that this is a little sensitive, giving a little shiver every time you change the angle, but it's likely this will be smoothed out by the time the i7500 hits the shops. Google's mobile baby has certainly taken a long time to get going, but now it has, things are swimming along. The HTC Magic was the first effort of 2009, and now we have the Samsung i7500 coming next month (although it's yet to be confirmed in the UK). Not only that, we've seen Huawei's effort that's supposed to be turning up, T-Mobile will be re-designing the G1 and HTC is likely to bring out its third Android phone in the Hero. All in all, lovers of Android (and its hard to hate it once you play with it for a few minutes) will be spoilt for choice... maybe taking out that two year contract to have the HTC Magic is a bit of a long stint, eh? We brought it up when discussing the chassis earlier, but a 3.5mm headphone jack is the difference between a smartphone that can play songs and a proper media mobile, which is what the Open Handset Alliance is pushing Android mobiles to be. It's not a bugbear when a top handset comes out without a headphone jack as we have to fiddle around with a separate adaptor, which leaves us looking like some audio-cabling monster from Doctor Who when walking around town. And all this in an 11.9mm-thin frame... good work, Samsung.